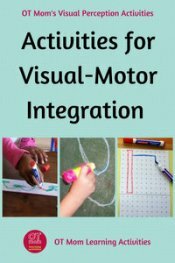 These fun and easy visual motor activities for toddlers and preschoolers will help work on their hand-eye coordination as well as their visual focusing and tracking skills. A toddler will spend a lot of time touching, poking and prodding, all of which are activities where the eyes alert the brain that there is something that looks interesting and to "please send the hands along to find out more". Although the eyes may guide the hands in initiating these activities, the eyes don't necessarily stay focused on the object that is being picked up, prodded, poked or touched. 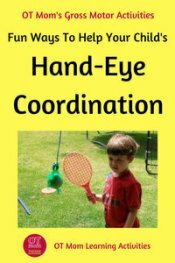 I encourage you to give your toddler and preschooler specific activities where the eyes need to focus and stay focused in order to guide the hands to successfully complete the activity. This will give your young child a chance to work on hand-eye coordination, visual focusing and tracking skills, all of which are needed for reading, writing and playing sports in a few years time. Click on the links below to jump to each activity on this page. Playing with trains on a track like this toddler is doing, is a good eye-hand coordination activity. The ridges on the track help his little hands to keep the train on the track. Using a car mat is also good, if you play alongside your child and encourage him or her to drive the car on the road without going off! If you don’t have a shop-bought car mat, make one out of a large sheet of butcher paper, or a flattened cardboard box (just make sure all staples and sharp edges have been removed). The homemade ones are actually more fun, because you can have real little houses, trees and objects to drive around! Your Kids OT has a lovely post about making a homemade car mat. You can make it harder by drawing a narrow track with more corners and turns. Peg Puzzles and Pegboards are lovely visual motor activities for toddlers and young preschool kids. Your child will need to focus carefully to get the pieces into the holes, especially at first. If you need some tips getting your child started with peg puzzles, read my page on teaching your toddler to do puzzles. I think that we, as parents, often underestimate the value of these old fashioned posting toys. They are great at getting little kids to focus on what their hands are doing. Toddlers love their repetitive nature and get a huge sense of satisfaction out of posting the shape in the correct hole and dropping things into slots. Shape sorters have the added value of helping your child develop visual discrimination skills. The toddler above is playing with an older child's "Connect 4" game by simply dropping the discs into the slots. 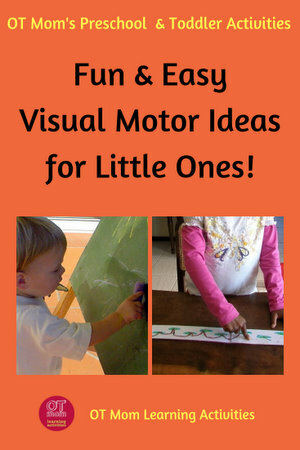 This is another "old-fashioned" toddler activity that gives lots of joy. Stacking one block or cup on top of another requires your child to pay attention visually and guide the hands in movement. Give lots of assistance at steadying any wobbly towers until your child gets the hang of placing the blocks or cups accurately. Give your toddler or preschool child a sorting activity, where they have to place the sorted items into a small container. This child is sorting colored pegs into little cups, but you can use buttons, bottle lids, or anything really. The key is that the items must be dropped into a specific place, and this will encourage the eyes to guide the hands. Please supervise carefully as small objects can cause choking! Playing with sand and water can give your child lots of sensory experiences! But you can also help your child develop visual motor skills when you give containers that need to be filled. The act of pouring and filling helps your child to coordinate hand movements with the information that the eyes are sending to the brain. So include some containers in bath play and add some to your sandpit today! Swatting a balloon into the air and keeping it up in the air is a great way to develop hand-eye coordination in preschoolers! You can also pop a ball into a net bag (the kind you get with vegetables), tie it to a rope and suspend it from a door frame or verandah. This makes a great way for your toddler or preschooler to practice catching or hitting a ball without chasing the missed balls all over the yard! Please be aware of the choking hazard with balloons! 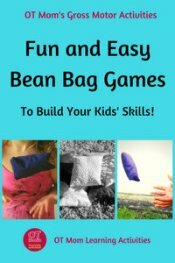 If your child needs a bit more challenge than the easy activities on this page, then head over to see some more visual motor and eye hand coordination ideas on these pages. Very occasionally, it can be appropriate for a toddler or preschool kiddo to sit down and do a paper-and-crayon activity. 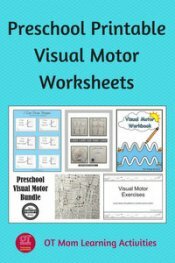 If you have been doing LOTS of hands-on visual motor activities, you can try some of these printables to supplement what you've been doing. 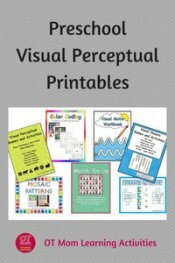 I hope you found these toddler and preschool activities helpful! Why not sign up for my free, occasional newsletter to keep informed about new activities and pages on my site?